Freewallet users saved over $520.000 on free internal transactions during the period between July 2017 and July 2018. That includes $400.000 in XMR transactions, $60.000 in Ethereum and ​$63.000 in Bitcoin. As a hosted wallet, Freewallet is able to provide free and instant transactions between Freewallet users. Those transactions are not registered in the blockchain which saves users from paying a network fee. The largest share of the funds saved on network commissions are in XMR. The absence of fees brought a great economy of $400k. Bitcoin ($63k) and Ethereum ($60k) also brought a tangible benefit to Freewallet users. Doge ($300) and Bytecoin ($2.4) complete the top-5 list with minor sums. “We spend a lot of effort developing the off-chain to save our users’ funds in means of both security and economy.” — recounts Alvyn Hagg, co-founder of Freewallet. I think it is an awesome feature for our users. In order to increase benefits for our users and also to increase their number, we developed an agreement with MinerGate. By this agreement, their users will withdraw mined coins without fees to Freewallet. Those withdrawals are not registered in the blockchain, so users won't even paynetwork fees. Next year we are going to enlarge our audience even more and break this year’s record, but it is only beginning of a long journey” Apart from that, the Freewallet team has calculated the most popular currencies. 23% transactions are made in Ethereum, 20% accrue to XMR, 17% is accounted for by Dogecoin, 14% - by Bitcoin, 11% - by Bytecoin. DigitalNote (4%), ZCash (4%), Bitcoin Cash (3%), Bitcoin Gold (3%) and Monero Original (1%) round out the top-10​. Recently listed as third most popular wallet on Android, Freewallet launched its first wallet on Android in January 2016. 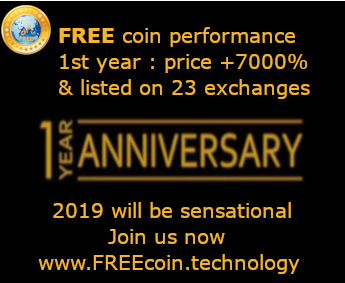 In 2018, Freewallet operates 25 cryptocurrencies and 250+ tokens. The Freewallet family includes Multiwallet on iOS, Android and web, 8 single currency wallets on iOS and 21 on Android. The number of Freewallet users has risen beyond 3M. Freewallet is trying to expand off-chain possibilities, co-oping with other companies. According to an agreement reached in December 2017 between Freewallet and MinerGate, a multicurrency mining pool, all transactions between MinerGate and Freewallet are off-chain and thus fee-free. This August, the two companies renewed this association on a regular basis.